Room types for you, for your friends, for a group, for singles, for couples, for everyone. Each bed includes hotel-grade memory foam mattresses, towels, small lockable boxes, along with individual outlets and reading lights. That's right, all linens, sheets, and towels are provided! And, we have plenty of hooks and storage space for you to store your belongings. Gender specific rooms are available, too. 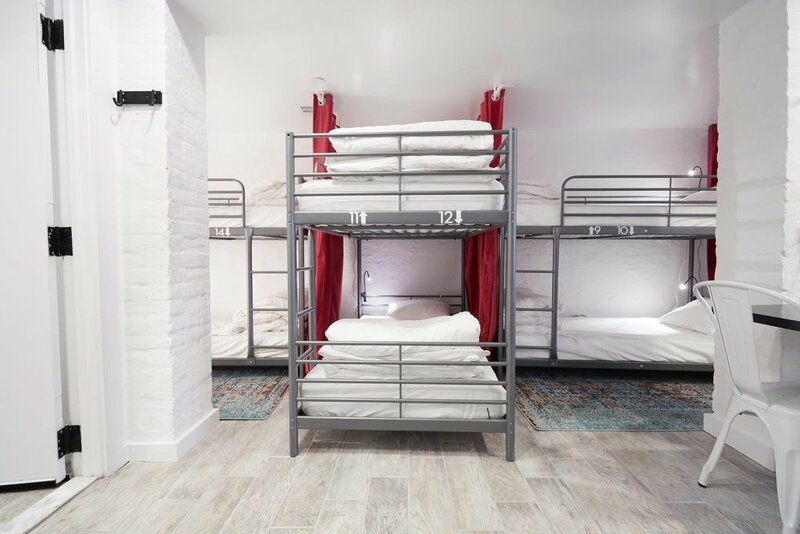 4 Bed Mixed Dormitory with two bunk beds. Each bed has a reading light. Locked storage is provided. Linens and towels provided. General cleaning is done daily. Luxurious bathrooms are located down the hallway from the room. 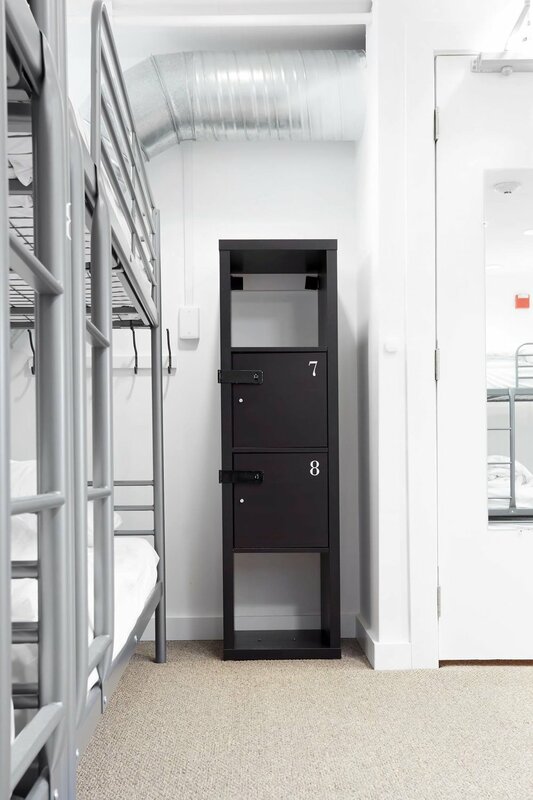 The Backpackers Dorm is made for good value. Up to 14 people total, Mixed Gender Dorm in our English Basement (lower level) with windows facing the street. Free towels, free small lockbox, free reading light, free coffee & tea upstairs. General cleaning is done daily. This room is located in the lower level of the property and there are five (5) private bathrooms with showers located one (1) floor above this room just a short walk up the stairs and 6 more bathrooms on floors above as well. 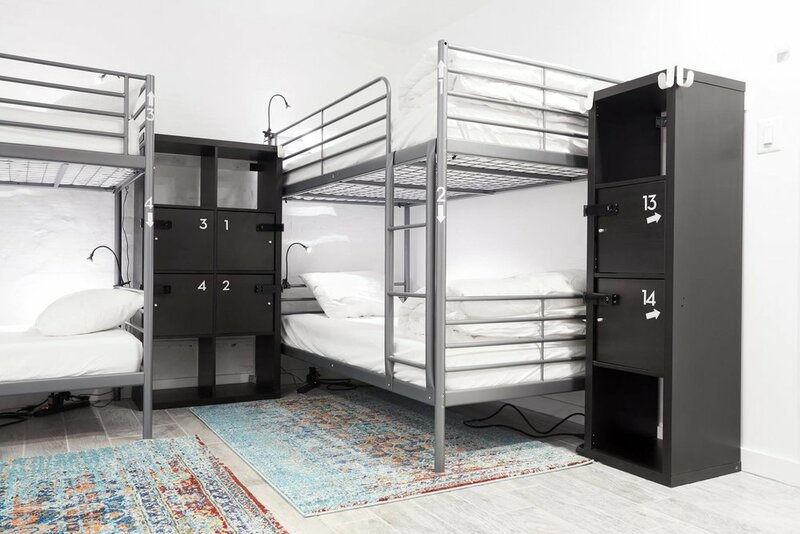 8 Beds Mixed Dorm with four bunk beds. Reading light, locked storage, linens, towels provided. General cleaning daily. 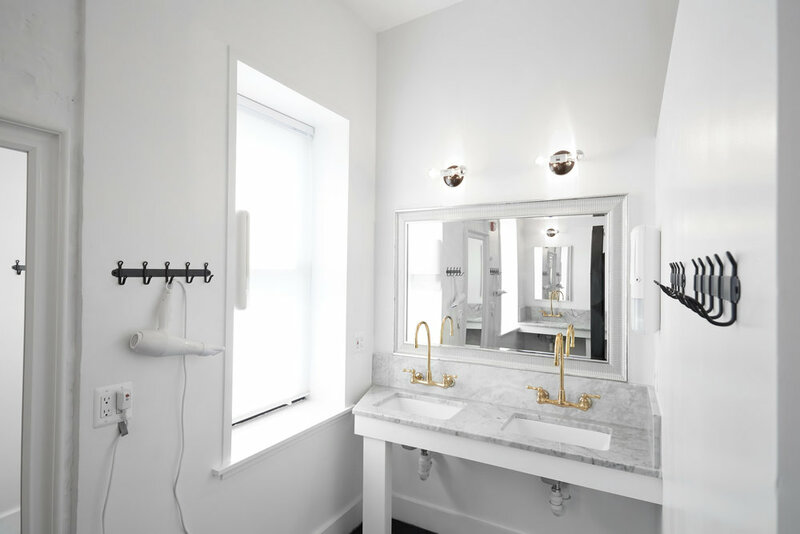 Luxurious spacious bathrooms are located down the hallway. This room is located on the upper levels and require 2-3 flights of stairs to reach. Because the room is on the upper levels it is typically quiet and peaceful. 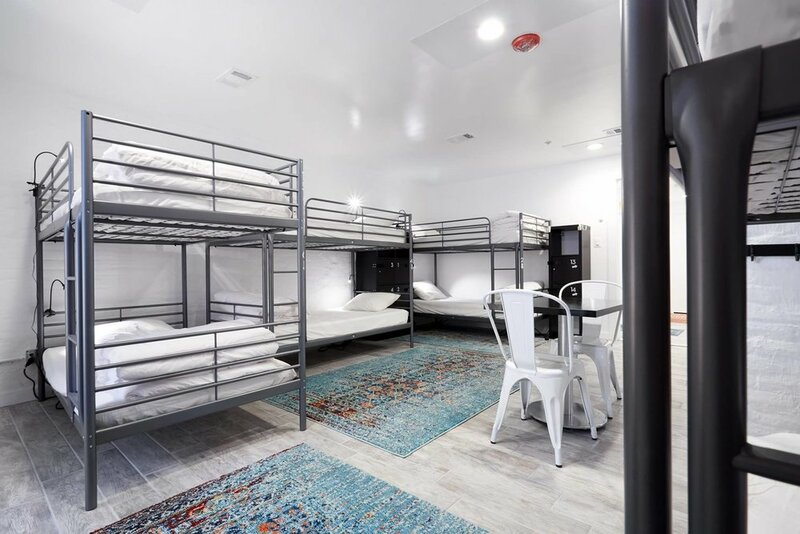 6 Bed Female Only Dormitory with three bunk beds. Bathroom in the room. Rainfall style shower head. Each bed has a reading light. Locked storage is provided. Linens and towels provided. General cleaning is done daily. This room is located in the lower level. Most guests find it cozy. Traveling on your own, with a small group of friends, or with your significant other? Enjoy your privacy in our stylish and spacious private rooms. Unless otherwise noted, most of our private rooms access shared bathrooms just a short walk down the carpeted hallway from the room. We clean our shared bathrooms several times a day. The bathrooms are not located in the private rooms unless otherwise noted. Book directly online with us for the best prices online. Just click on the "Check Availability" button at the bottom of this page. This cozy private room has a bunk bed with twin on top, full on bottom sleeping up to three people. Great for couples, for groups of friends, or anyone who would want a room for 1 to 3 people. The shared bathrooms are located just a short walk down the carpeted hallway. Bathrooms are separated by gender -- there is a separate men's bathroom and a separate women's bathroom. This room is located on the third floor up two flights of stairs from the lobby. All linens and towels are included. We have free soap, shampoo, etc too! You'll of course have access to all the common areas. hang out space, and designer kitchen that the hostel has to offer. This cozy private room has a bathroom in the room. The room has a bunk bed with twin on top, full on bottom sleeping up to three people. Great for couples, for groups of friends, or anyone who would want a room for 1 to 3 people. There are more shared bathrooms located just a short walk down the carpeted hallway. This room is located on the second floor up one flight of stairs from the lobby. There is no elevator. The room faces the back of the property and does not have a view. This private room has a bathroom in the room. The room has a queen-size bed plus a lofted twin bed. The room sleeps up to three people. This room is located on the third floor up two flight of stairs from the lobby. There is no elevator. This is a quite cozy private room with a bunk bed with a full size mattress on the bottom and also a full size mattress on the top. The room can sleep up two people given its small size. Great for couples, groups of two, for solo travelers looking for a private sleeping room. The room does not have a bathroom in it. The closest bathroom is a short walk down a carpeted hallway, and more bathrooms are located on the same floor around the corner. This room is located on the main floor and on the same floor as the lobby. Please note: Although there are no stairs to get to this room from the lobby, stairs are required to enter the property from the street. Unique private room in our upscale hostel - One queen-size bed occupies the lower level, with another queen-size bed and two twin beds in the "loft" space up the stairs. Access to common areas & bathrooms. Perfect for groups of travel buddies! Sleeps one to six people.